Gartner has predicted that Money transfer applications, Location based services and mobile search will be amongst the top 5 mobile application categories by 2012. The predictions are basis the revenue projections, loyalty and business model, consumer value and estimated market size and penetration of each of these application categories. Consumer mobile applications and services will no longer the prerogative of mobile carriers. The increasing consumer interest in smart-phones, the participation of Internet players in the mobile space, and the emergence of application stores and cross-industry services are reducing the dominance of mobile carriers. Each player will influence how the application is delivered and experienced by consumers, who ultimately vote with their attention and spending power. A few inferences that can be drawn about the mobile applications perspective: The Importance of the eco-system approach to develop and deploy applications and the emergence of MVNAs (Content aggregators) and MVNEs (Content Enablers)! Gartner also predicts customers will use no more than 5 mobile applications, which would be chosen according to their needs and demands. There will be opportunities from niche market apps as well. 1.Money transfer ranks No. 1 on Gartner’s 2012 biggest applications list, contending the service’s lower costs, speed and overall convenience boast strong appeal to users in developing markets. 3.Mobile search, is listed third due to its dramatic impact on technology innovation and industry revenue. 4.Mobile browsing–according to Gartner, browsers will be available on about 80 percent of handsets shipping in 2012, compared to 60 percent of devices in 2009. 5.Mobile health monitoring is fifth, followed in descending order by mobile payment, NFC, mobile advertising, instant messaging and mobile music. SmartPhones: Will they become primary mobile devices in future? 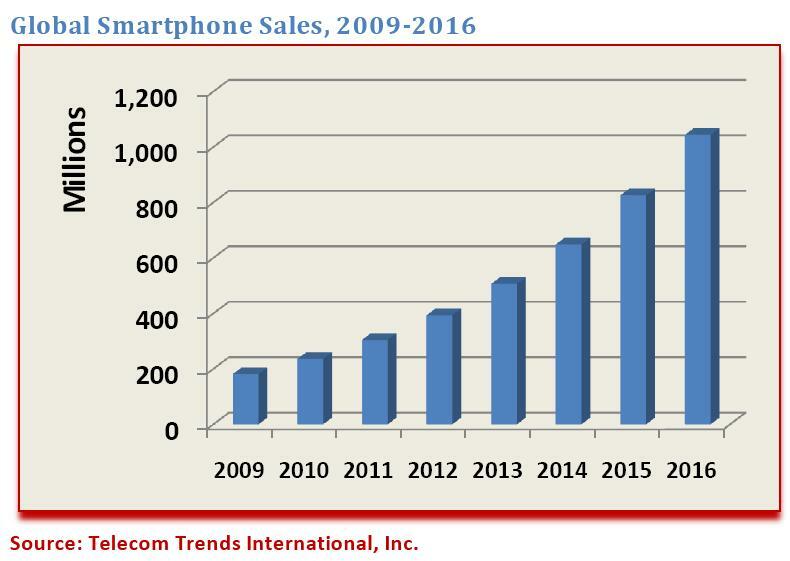 World over sales of smart-phones will exceed that of regular handsets by 2015, so much so that by 2016, smart-phones will constitute 2/3rds of total mobile phone sales.This has been reported by a Telecom trends international study. The report goes on to say that Smartphones will become the primary mobile device recording robust growth of 28% through 2016. On the other hand, the sales of the regular handsets will start declining. 1. Africa and Asia are the two markets which will power the growth in mobile handset population. The present population of handsets world over is 4 billion handsets. 2. Between 2010-2015, Asian markets would reach high volume penetrations. There would also be a strong demand of higher end handsets on a replacement basis. 3. However, I am apprehensive of African numbers. 4. Overall however, the replacement demand will have strong contribution from Latin and North America, Asia, Europe and Oceania. 6. World over adoption of 3G and 4G mobile broadband will again bolster demand for Internet browsing devices. 7. Even with an internet sidedness of mobile communication and the utility of smart-phones, price would be a hindrance to smart-phones mass acceptance as the primary device. 8. Then, there are other devices and technologies which would emerge to be strong contenders to smart-phone functionality. Net-books could be an example. And you never know what radical innovation lies round the corner. Net of all things, 66% of handset sales from smart phones by 2016 will be a tough one. Upgrades and high end devices, probably yes, but smart-phone @ 66% looks a bit stretched. What are your thoughts: Can smart-phones be 2/3rds of the market by 2016? What would Google’s self branded smart-phones mean for Google, its eco-system, its partners, competitors and Consumers? A report by Northeast securities analyst, Ashok Kumar has caught onto the fancies of the Tech Bloggers world. The idea and the question is: What if Google makes and markets self branded smart-phone? Kumar spoke on Google’s plans: ”Google is expected to launch a self-branded smart-phone by year end followed by netbook early next year. In its smart-phone push, Google is expected to embrace the retail channel at the expenses of carrier with the intent of greater account control. It will embed the same iteration of Android as the Motorola Droid. The hardware, featuring Qualcomm baseband, is expected to be competitive with Motorola’s offering. Essentially the rumor (which is all that we have at this time), speaks about Google’s tie up with smart-phone OEM for a Qualcomm -powered device running the Android 2.0 Éclair. The netbook would be designed in coordination with Quanta and would be Qualcomm Snapdragon powered. It will sport the Chrome OS. This then would be Google’s first effort at devices and the thought leading up-to its foray into devices is that Google intends to take control of its phone experience and is not confident that the current lot of smart-phone makers can make devices that explore the full suite of Google services. Ashok Kumar also suggests that Google will not sell their phones via carriers, and instead will come unlocked to take any carrier, and will be sold directly in retail stores. Intending to take control of its phone experience. While it would like to more tightly integrate its online services with a phone, Google is concerned that HTC, Samsung and others would regard a self-branded device as an unfair advantage. Google is apparently in talks with a Chinese company who will be manufacturing both the mobile handset and the netbook. It is not entirely too difficult for any company to make a phone these days, as long as they get at least one part right. Android and its suite of Google services hold a great promise (and challenge to the Apple OS) but Google needs a device as sophisticated as the iPhone to be taken seriously. Google already has all the data they need and they have the software too. So commissioning another company to make the handset according to their specifications does sound like the next logical step. Delivering Android better: Microsoft has never turned Windows Mobile into anything, in part, because the hardware has not been anything special. Google thinks it can do better and, perhaps, suspects that handset manufacturers are not as smart as Google, which wrote the Android OS and created services the phone will run. This is the “Motorola, Nokia, etc., are clueless” part of the argument. Game changing move: The Open handset will go down extremely well with consumers who often have to tie themselves into lengthy contracts with mobile phone carriers or go to the hassle of unlocking a phone so that it can be used on another network. Keeping Apple on its toes: Google does release its own phone. Aside from the wealth of iPhone apps, the iPhone’s greatest advantage over the competition is the sheer seamlessness of its integration of hardware device and the iTunes-related services. Many companies try to ape Apple’s level of hardware-software-service integration, and very few even come close. 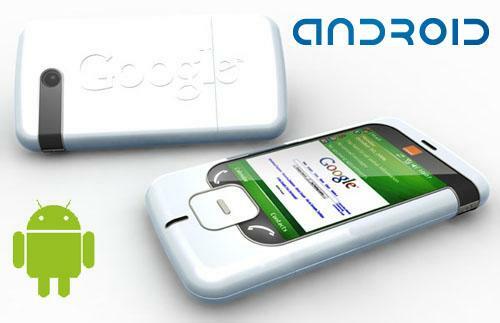 The Android eco-system Google Smartphone combination may be the best bet yet to challenge the iPhone eco-system. It will surely keep Apple on its toes. Selling Direct: The cost of the handset would be a big consideration. After all smart-phones do sell the volumes they sell because of heavy operator subsidies. Secondly, it might also have the effect of undermining the carriers and manufacturers who have till now been promoting, subsidizing and selling Android phones. Loss in focus of its core proposition: One important part of the ecosystem would be to have a set of well-functioning applications (an office productivity suite, for example). Google is mostly leaving applications development for Android to third parties (applications which run in the browser like Google Docs being the notable exception). At the rate things are going, we don’t see enough of these third parties developing applications for Android netbooks in the next 12 months. Google would be better off concentrating on building music and app stores, modeled after Apple. Those are Apple’s no-so-secret weapons and until Google can really compete, there is nothing to stop the iPhone. Antitrust issues: Google is now so dominant in search that a revived American antitrust division is already making noises. They already have the choice of Android or Chrome for mobile internet devices and now, if they are able to make headways into the netbook industry they’ll make the Microsoft of old look modest. Maybe the smart-phone marks the decline of the wireless hardware vendor and rise of the OS and applications provider. The iPhone seems to prove this. Maybe the only company that can make Android a hit in the marketplace is Google itself, by selling hardware it designs. That is the principle argument in favor of Google and its smart-phone efforts. The way Google handles its relationships with its current partners will be crucial to future relationships. Alternately, perhaps Google will get into the handset business and the other handset companies will run away from the Googl eco-system, leaving Google alone with a loser phone and a not-very-exciting ecosystem on the edge of extinction. Almost like Microsoft, but for different reasons. Google may aspire to walk the middle path. A Google-made Android phone would further intensify competition between the Google and Apple. Worldwide mobile phone sales appears to be tanking with a YOY (3Q 2009 versus 3Q 2008) increase in sales of .1%. This contrasts sharply against a 12.2% YOY (3Q 2009 versus 3Q 2008) increase in smart-phone sales. This is according to the 3Q Mobile phones report by Gartner. The 3Q,2009 was charecterised by channel slowed its inventory-reduction efforts leading to increase in sales volumes and stagnation of average selling prices (ASPs). Gartner further predicts an increase in sales in the 4Q holiday season. This however will not lead to any increase in the 2009 figures, which will end up stagnant vis a vis 2008. Android’s coming to mainstream would increase the complexity and competition in the smart-phone space. 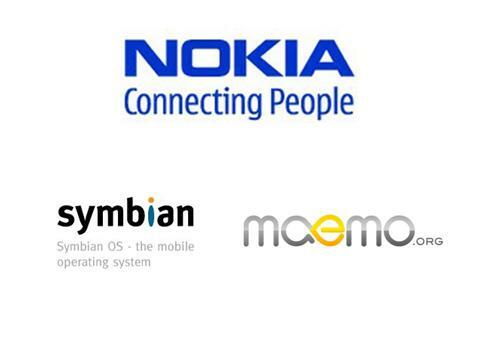 Hardware commoditisation and the growth in open platforms will make it harder for devices and platforms to stand out. Grey-market sales are no longer limited to China and all manufacturers will have to compete with gray-market players as they expand into emerging markets in Asia/Pacific, Eastern Europe, The Middle East and Latin America. A greater cause of concern is the fact that Grey-market devices are no longer just ultra-low cost models. 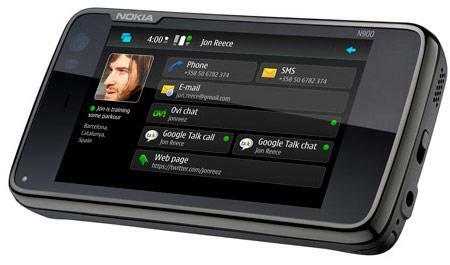 Feature enhanced phones also feature as a part of the grey market devices. Nokia appears to still be loosing ground to Samsung who have so far done extremely well with the mid range touch phones: Star and the Corby series. LG also had a decent run with its Cookie series. Going forward the release of Nokia 5230 and 5530 will be an interesting thing to watch out for, as these mid range Nokia devices may prove to be instrumental the market share fight. Research In Motion reached 20 per cent share, its highest yet. RIM’s sales volumes rested on the Curve 8900 in Europe and the Tour and Storm 2 with Verizon Wireless in the US. RIM also focused on pre-paid sales and more flexible BlackBerry Internet Service offerings, which helped to drive volumes in emerging markets like Latin America. Apple’s worldwide smartphone share reached 17 per cent as iPhone sales totalled 7 million units in the third quarter of 2009 following the continued rollout of the iPhone 3GS in new countries. Its ASP is holding steady and sales in the fourth quarter should be even stronger as Apple starts selling in China, through one additional carrier in the UK, and in an additional 16 countries. In the Mobile operating systems space, Android seems to be picking up momentum basis new launches that feature the Android. Sales of Windows-based smartphones saw another decline with the Winmo 6.5 failing to enthuse the markets. Last month Indian Telecom subscribers crossed 500 million. There are enough and more studies on the impact of telecom penetration on the economy. One study correlates 10% increase in tele-density to .6% increase in GDP. The canvas is $520 billion increase in GDP over 8 years time frame. The need is for a communications model that reaches out to the remotest citizen and low cost wireless solutions. The existing industry spectrums: 850MHz/ 900 MHz/1800 MHz are grossly inadequate for the traffic. The 3G option is being looked at as a solution providing greater bandwidth for voice and data traffic. Given the high 3G auction fees, the 3G option ensures service qualities at a high CAPEX and OPEX. High speed telecom networks would be the key for a long term momentum in the economy as suggested by McKinsey,2009. India would have gained over $16 billion (PPP) in the last 2 years but for delay in introduction of high speed mobile BB. The spectrum: How it pans out and how the digital dividend is a part of it? Digital compression technologies and coding systems make it possible to squeeze much more information into a radio signal than in the case of analogue technology. Digital TV is many times more spectrally efficient than analogue TV, which means UHF spectrum will be freed up. Large amount of spectrum that would be freed up in case of switchover from analogue to digital terrestrial TV is known as the Digital Dividend. The analogue TV switch-off represents a “once in a generation” opportunity for a significant reallocation of spectrum. This spectrum has excellent propagation characteristics and can be used very effectively to roll out mobile broadband services in rural areas and to provide in-building coverage. It is approximately 70% cheaper to provide mobile broadband coverage in the 698-806MHz band than at 2100MHz. This means networks can be rolled out quickly and cost-effectively, bringing cheaper services to consumers. It is approximately 70% cheaper to provide mobile broadband coverage at frequencies (approx. 800MHz) than over 2100MHz.This means networks can be rolled out quickly, cost effectively, bringing cheaper services to consumers. Target resource for rural broadband wireless access worldwide. Reduce capital expenditure, which makes deployment in rural or high-cost regions economically viable. An LTE network at 700 MHz would be 70% cheaper to deploy than an LTE network at 2.1 GHz – GSMA. Spectrum Infrastructure: 700 MHz versus Others! The iPhone was officially released in mid 2007. In two and half years, it has captured the fanfare and frenzy of the device and telecom geeks acquiring the status of an Icon and fuelling Apple’s growth story. There have been many challengers from Samsung, HTC, Sony Ericsson, Nokia and others, but iPhone has held its ground because it combines a glitzy UI, a remarkable device and a 100 thousand strong applications store to its strength. That doesnot stop the challengers from take shots at the frailties of the iPhone. One of the strongest challenge to iPhone yet is the upcoming Motorola Droid on the Verizon Network and backed by the new Android OS 2.0 (Eclair). That is a strong proposition and they have their sights set on iPhone if the “Droid Does” campaign is to seen. Watch the video here. The latest in this round is the Droid stealth commercial which is an announcer of the launch date amidst a hyper technology scenario. Catch the video here! What the “Droid does” to the “iPhone” will be an interesting thing to watch. Watch this space.